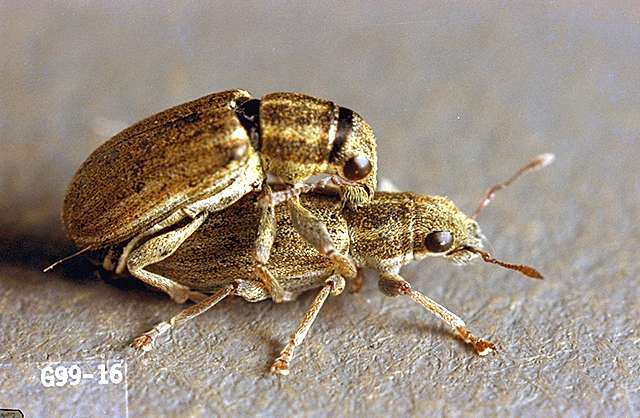 Pest description and crop damage Adults are grayish-brown, slender weevils about 0.19 inch long with a short snout. Wing covers are marked lengthwise by parallel striations. 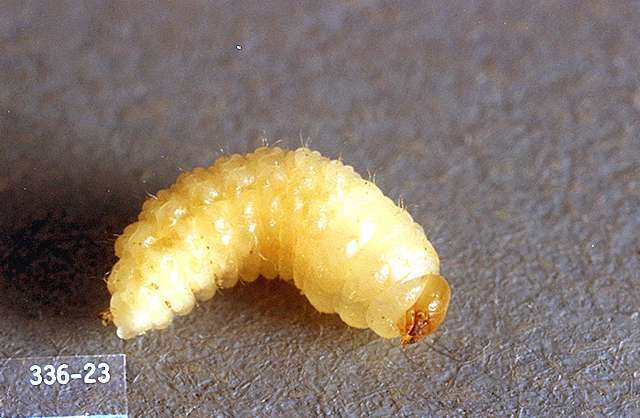 Larvae are small, C-shaped, legless, soft and fleshy, and up to 0.19 inch long. They are milky-white with a brown head. The pea leaf weevil can be confused easily with the sweet clover weevil. The pea leaf weevil has three light-colored, inconspicuous stripes that extend lengthwise down the thorax and often onto the wing covers. Sweet clover weevils do not have these stripes. 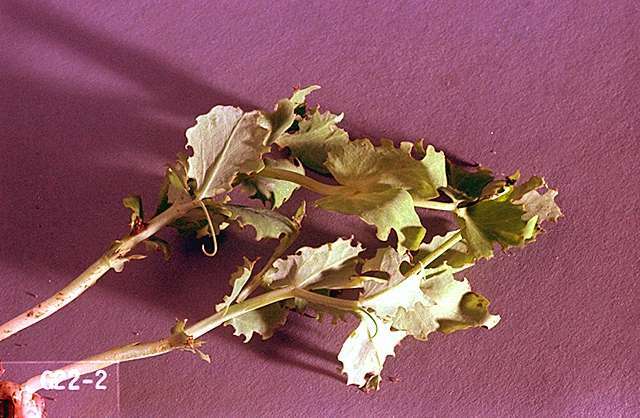 Seedlings are very susceptible to injury and may be killed if the growing tip is damaged. Damage also may occur later in the year by larvae feeding on the roots of plants, particularly on root nodules. However, older plants-six or more expanded leaves with growing tips intact-are much less likely to suffer significant injury. Adults chew half-circle notches out of leaf margins, and larvae feed on rhizobial root nodules. Host plants include peas, alfalfa, clover, faba beans, and vetch. Biology and life history Adults overwinter under vegetation in old alfalfa and clover fields or in waste areas. Adults begin in mid-March on the coast and in mid-April to early May inland. Eggs are scattered on the soil surface near plants. Eggs hatch in 16 to 18 days, and larvae move into the soil to feed on root nodules. Larvae feed for 20 to 40 days, then pupate in the soil. Adults emerge in July and August and disperse to other legumes. They either feed or summer hibernate (aestivate) before overwintering. In coastal areas, there may be activity during mild weather in the fall and winter. There is one generation each year. Pest monitoring Pea leaf weevils thrive under cool, wet conditions and become less of a problem as the weather warms. Sweeping can be used for sampling. Cone traps with aggregation pheromone also can be used. 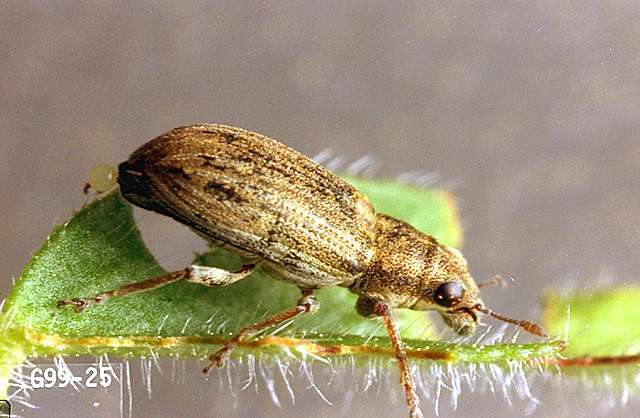 Economic damage can occur at densities as low as one-third adult weevil per seedling plant. Growing-point injury of 25% on seedling plants may be considered an action threshold. Crop rotation and planting beans away from other legumes is useful. Irrigation and proper fertilization may help crops outgrow defoliation. alpha-cypermethrin (Fastac EC) at 0.017 to 0.025 lb ai/a. PHI 1 day. REI 12 hr. Retreatment interval 5 days. Do not exceed 0.075 lb ai/a per season.